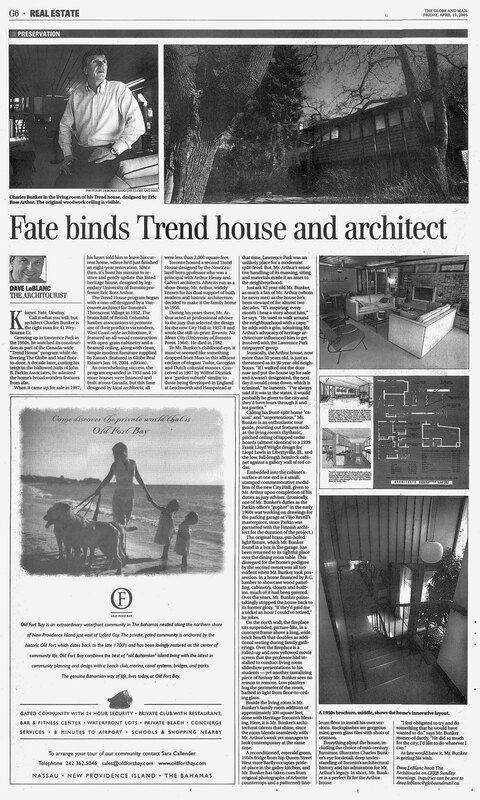 Looking through my email archives the other day I came across an article from the Globe & Mail in April of 2005 by Dave LeBlanc which I meant to upload to the site. The article describes the great care with which the current owner, architect Charles Bunker is preserving and restoring the house originally designed by Eric Ross Arthur. Call it what you will, but architect Charles Bunker is the right man for 41 Weybourne Cr. Growing up in Lawrence Park in the 1950s he watched it’s construction as part of the Canada wide Trend House program while delivering the Globe and Mail door to door. A decade later, cutting his teeth in the hallowed halls of John B Parkins Associates he admired the home’s broad wooden features from afar. When it came up for sale in 1987, his heart told him to leave his current home, where he’d just finished an eight-year renovation. Since then, it’s been his mission to restore and gently update this listed heritage house, designed by the legendary University of Toronto professor Eric Ross Arthur. 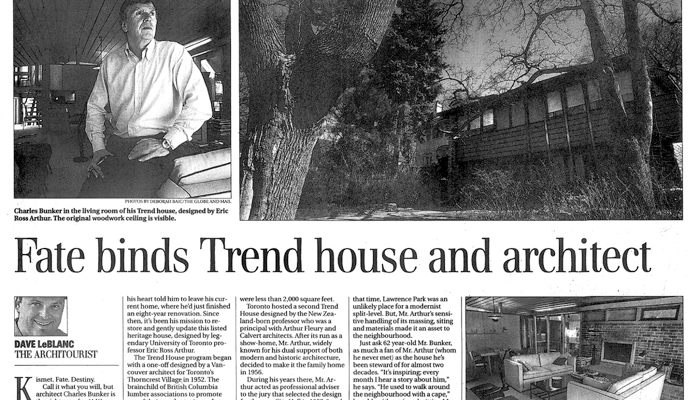 The Trend House program began with a one off designed by a Vancouver architect for Toronto’s Thorncrest village in 1952. The brainchild of British Columbia lumber associations to promote use of their products via modern, West Coast style architecture, it featured in all wood construction with open grain cabinetry and a beamed ceiling, along with clean, simple modern furniture supplied by Eatons (featured in Globe real estate January 16, 2004 edition). An overwhelming success, the program expanded in 1953 and 10 more houses were financed and built across Canada, but this time designed by local architects; all were less than 2000 ft.². Toronto hosted a second Trend House designed by the New Zealand born professor was a principal with Arthur Fleury and Calvert architects. After it’s run as a show home, Mr. Arthur, widely known for his dual support both modern and historical architecture, decided to make it the family home in 1956. During his years there, Mr. Arthur acted as a professional advisor to the jury that selected the design for the new City Hall in 1957 and wrote the still in print Toronto: No Mean City. He died in 1982. To Mr. Bunker’s childhood eye it must’ve seemed like something dropped from Mars in this affluent enclave of elegant tutor, Georgian and Dutch colonial manors. Conceived in 1907 by Wilfred Dinnick as a garden suburb similar to those being developed in England at Letchworth and Hempstead at that time, Lawrence Park was an unlikely place for a modernist split-level. But, Mr. Arthur’s sensitive handling of it’s massing, siting and materials made it an asset to the neighborhood. Just ask 62 year old Mr. Bunker, as much as fan of Mr. Arthur [who he never met] as the house he’s been steward out for almost 2 decades. “It’s inspiring; every month I hear a story about him” he says. “He used to walk around the neighborhood with a cape” he adds with a grin, admitting Mr. Arthur’s advocacy of heritage architecture influenced him to get involved with the Lawrence Park ratepayers group. Calling his front split hold “casual” and ” unpretentious” Mr. Bunker is an enthusiastic tour guide, pointing out features such as the living rooms rhythmic pitched ceiling of lapped cedar boards (almost identical to a 1939 Frank Lloyd right design for Lloyd Lewis in Libertyville Illinois) the low, full-length hemlock cabinet against a gallery wall of red cedar. The original brass, pin-holed light fixture, which Mr. Bunker found in a box in the garage has been returned to its rightful place over the dining room table. This disregard for the home’s pedigree by the second owner was all too evident with Mr. Bunker took possession. In a home financed by BC lumber to showcase wood paneling, cabinetry, closets and built-ins, much of it had been painted. Over the years Mr. Bunker painstakingly stripped the house back to its former glory. “If they paid me a nickel for every hour I could’ve retired”, he jokes. On the north wall, the fireplace sit suspended, picture like in a concrete frame above a long wide brick hearth that doubles as additional seating during family gatherings. Over the fireplace is a rolled up and now yellowed movie screen that the professor had installed to conduct living room slideshow presentations to his students – yet another tantalizing piece of history Mr. Bunker sees no reason to remove. Low planters hug the perimeter of the room bathing light from floor to ceiling glass. Beside the living room is Mr. Bunker’s family room addition of approximately 300 ft.², done with Heritage Toronto’s blessing. Here, it is Mr. Bunker’s architectural talents that shine, since the room blend seamlessly with Mr. Arthur’s work yet manages to look contemporary at the same time. A reconditioned, emerald green, 1950s fridge from Hip Queen St. West store Barfly occupies pride of place in the galley kitchen, and Mr. Bunker has taking cues from original photographs of our bright countertops and a patterned linoleum floor t install his own versions. Backsplashes are gorgeous mint green glass tiles with shots of Crimson. Everything about the house, including the choice of mid century furniture, illustrates Charles bunkers I for detail, deep understanding of Toronto’s architectural history and his admiration for Mr. Arthur’s legacy. In short, Mr. Bunker is a perfect fit for the Arthur house. As fate would have it, Mr. Bunker is getting his wish. Victoria: the smallest at 825 square feet. Architect John A. DiCastri. Interesting for its arrowhead-shaped floor plan. Vancouver: 1880 square feet. Architects Davison and Porter. Edmonton: 1280 square feet. Architects Dewar Stevenson & Stanley. Featured built-in wall combination of a television, radio, fireplace and storage space. Calgary: 1516 square feet. Architects Rule Wynn & Rule. Regina: 1035 square feet. Architects Stock Ramsay & Associates. Winnipeg: 1750 square feet. Architects Smith Carter Katelnikoff. London, Ont. : 1180 square feet. Architect Philip Carter Johnson. Unconventional framing method used prefab, glue-laminated hemlock arches to support roof (no load-bearing walls). Toronto: 1700 square feet. Architects Fleury Arthur & Calvert. Eric Arthur, a University of Toronto professor and author of Toronto, No Mean City, designed this home at 46 Weybourne Cres. for himself and his family. Montreal: 1635 square feet. Architect Philip F. Goodfellow. Halifax: 1360 square feet. Architects Davison Duffus Romans & Davis. Dave LeBlanc hosts The Architourist on CFRB Sunday mornings. Inquiries can be sent to dave.leblanc@globeandmail.com.